Mardi Gras in New Orleans ~ Mommy Meowmeow! I haven't been to too many places in the U.S. but definitely New Orleans would be UP THERE in my list of favorites :) There's just something sooo magical and alluring about this place that makes me want to go visit again and again and again..hopefully soon, right Daddy A? 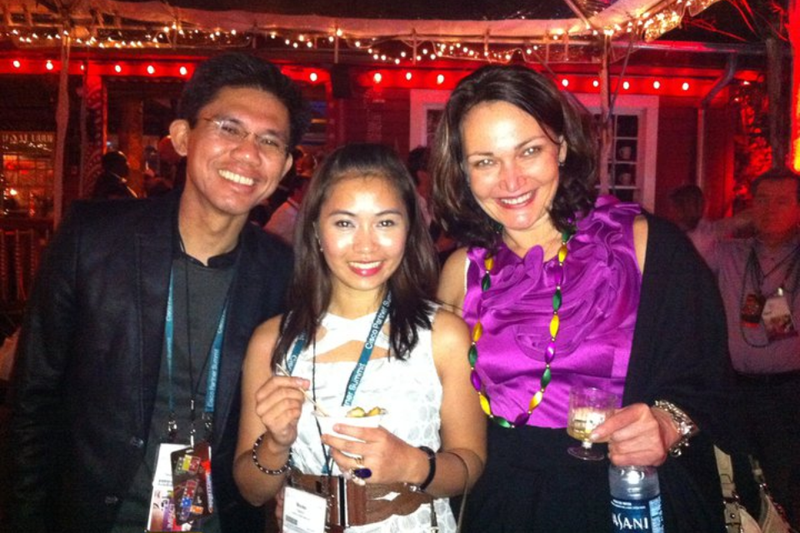 Four years ago I was invited to Cisco's Partner Summit held in New Orleans and it was such a huge blessing that I was able to arrange for everything in a month - a nearly expiring passport, a U.S. Visa, accommodations, etc. I really wasn't expecting much from the trip and was probably more afraid than excited as I was practically traveling alone. After a few days in California with my relatives, I ventured to NOLA on my own. Good thing I arranged for hotel transfers before I left Manila so I didn't have to worry about that. But my gulay, was I surprised when the hotel didn't want to accept my credit card. I know I made sure to pay off the balance even if they weren't due yet. I guess I was a bit lucky that I didn't do my shopping yet so I still had a few dollars on me. Whew! The hotel transfer via bus was like a tour on its own already. While dropping off people, the driver was also sharing a lot of snippets about his city. We were also able to see Tulane University and the lovely houses (and their steps!) around the area. Aaaahhhh....so much beauty in one place! But of course I was on tipid mode that time so I also lugged in my snacks and my tide bar to do my own laundry. How I managed to survive the trip, attending conferences, spending early evenings out, calling then-bf during the most convenient hours and finishing my thesis in time? I honestly don't remember!! I got my first taste of New Orleans at a restaurant just a block away from the hotel. Oh, I instantly got hooked on Gumbo!!! A hot bowl of Seafood Gumbo was all I needed to feel welcome in the Big Easy! A place we frequented when in Bourbon St. was the Le Bayou Restaurant. Well, it's upon the recommendation of a DLSU faculty when I was still finishing my Master's Thesis. I ordered a few po' boys and probably tried their gumbo too (?). I was amazed how their police were actually using horses while on patrol duty. And look at that mighty black beauty! Was it just for the Mardi Gras celebration? You see, this is a "what-could-have-been" of our own dear Intramuros in Manila. And what is a stay in New Orleans without joining a tour or two? We ventured towards the Haunted History Ghost Tour. Our tour group was large so it wasn't as creepy but the tales would leave your balahibo standing! Yep, specially if you were staying in some of the hotels mentioned in the tour! Aptly so we were gathered outside Rev. Zombie's Voodoo Shop. For a 2-hour tour it cost $25 and we were regaled with tales of naughty ghosts using your camera while taking your picture, naked lady ghosts jumping off a rooftop, torture and butchery, a love story that ended horribly and also the fire that ensued in the quarters. Such wide esquinitas, I wish we have here..
That's the shadow of the Virgin Mary's statue at the church plaza..
And when they're not straddling horses, the police are on their wheels too! Just some of the views (feeling street photographer na!) while on the haunted tour. I wonder what they're brewing in that cauldron. Also, if you ask me, one thing I do love about this place is its old world charm preserved through the years. I loved this place even before they started with The Originals TV series! Pero wag kayo mga 'teh, there are also some haunted stories involving some balconies, their version of Romeo & Juliet...#creepy hehehe.. I'm in love with their French Creole balconies! That's our tour guide right there! But who would be creeped out if there are lots of folks partying around and throwing beads around?? Over all it's a nice trip I'm forever grateful to have taken. A test of independence, albeit for a few days only. Also a nice feeling to see the other side of the world and have met and made new friends and acquaintances. And for getting me to dance up on stage to the tune of - Nobody, nobody but you (aiiieee!! hahahaha). And and and! Let's not forget, the food; if only for this I shall be back New Orleans! Is she who we think she is? ?